Just before the party began I questioned if I should of had it at all. Maxwell had a small break through seizure outside and I was scared it was all going to be too much for him. We had postponed the birthday party a few weeks so that Maxwell would be able to enjoy the party and hopefully be seizure free. We questioned whether to cancel it all together, but how can you tell a little boy he was not having a birthday party. Especially after everything he has been through in the past month. Well I was not going to do that and wanted to give him the best birthday ever! He had the best day ever as he told me, despite that break through moment he had no other issues for the rest of the party. 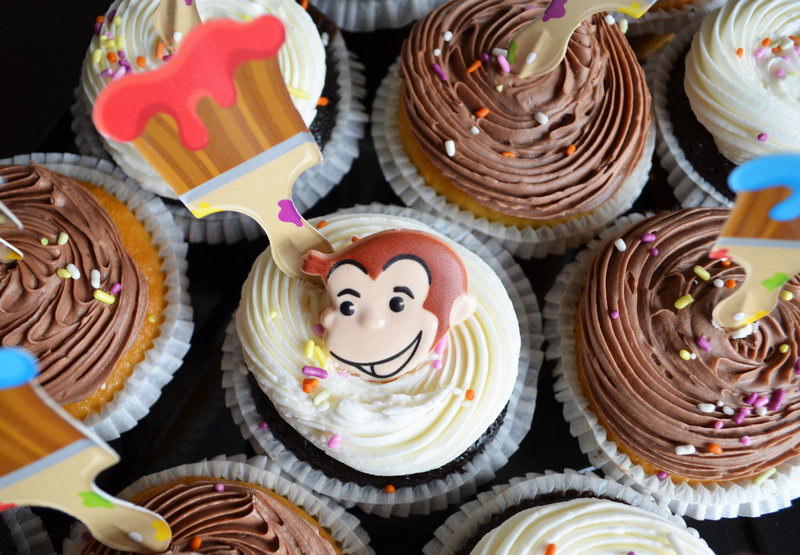 I did not want to just give him a Curious George theme so I decided he would have a Curious George painting party. I started brainstorming on what the painting craft could be and the end result could not have been more adorable. How about my table?! Cute right!!! Maxwell’s stuffed Curious George holding the balloons was my favorite part. 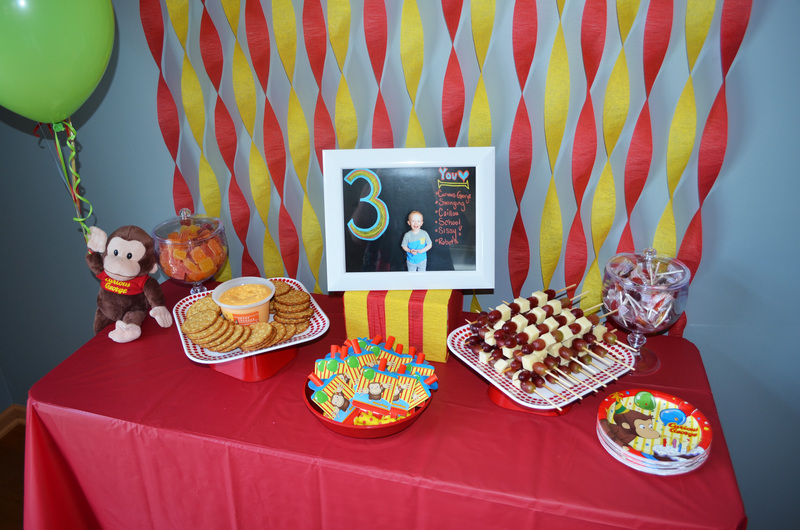 Close up on table which has his three year old picture, George stuffed animal and balloons, red and yellow streamers, suckers, jelly candies from Trader Joe’s, red grape and jack cheese skewers, cheese and crackers, George party blowers. 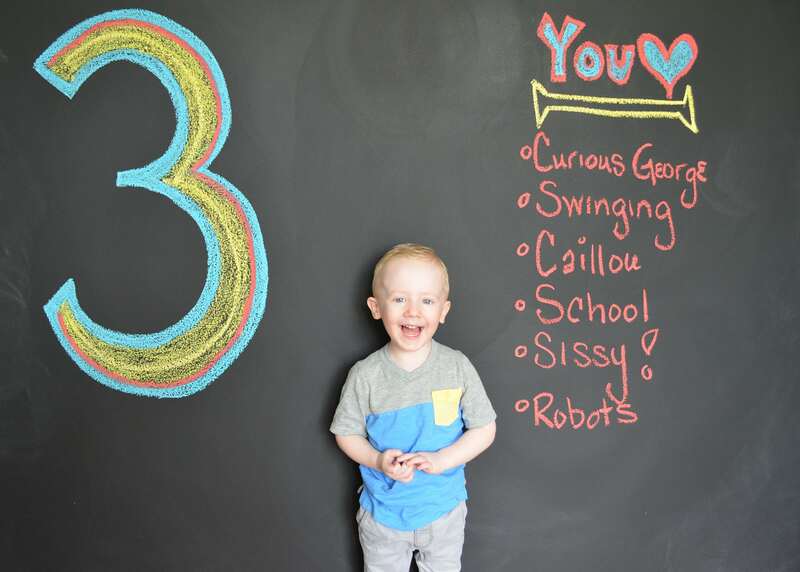 Love, Love, Love the three year birthday photo I took of Maxwell in front of our chalkboard wall. How handsome! 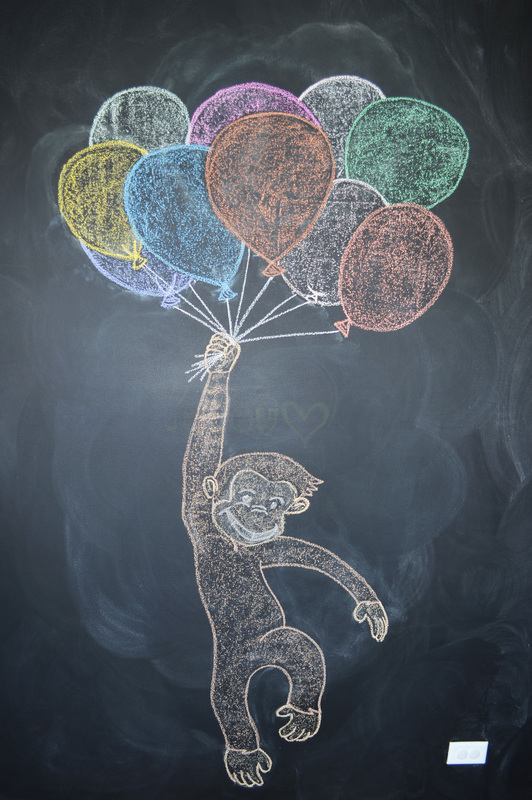 Drawn here is a large Curious George on our chalk board wall! Great idea to have kids take pictures with George. Pulled up curious George coloring pages on Google Images to help for visual of the outline. 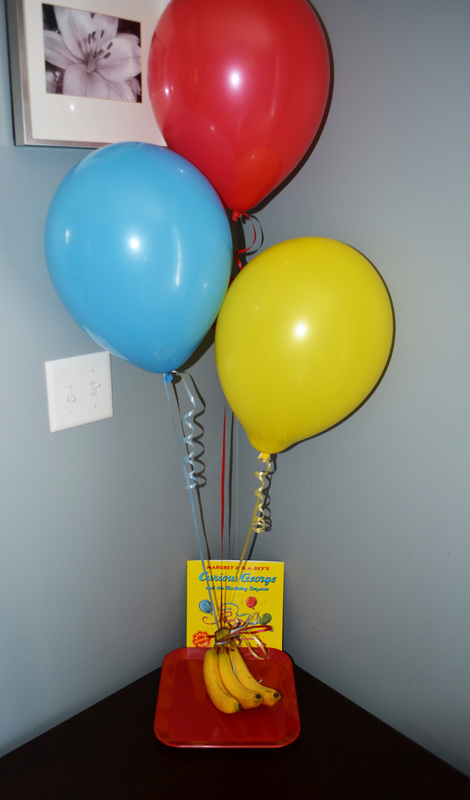 Over on the kids table I placed bananas as the anchor to the balloons and added the Curious George birthday book behind. 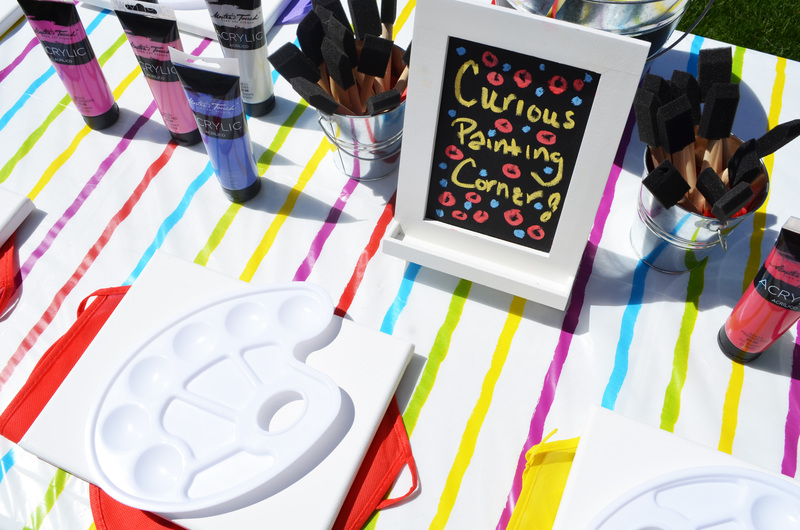 Now time to paint at your curious painting corner/table. 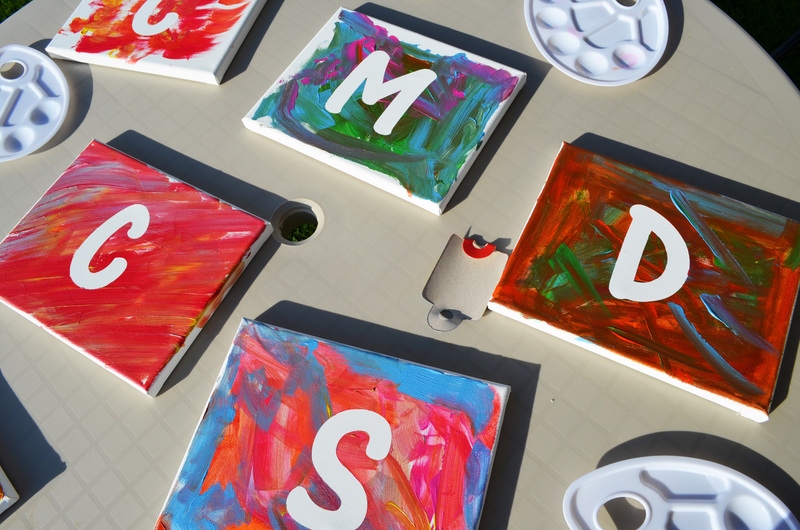 I used white canvases, bought inexpensive kids smocks on Amazon.com, and also on Amazon.com the adorable paint palettes, lots of foam brushes for different color use. Maxwell and his little friends had so much fun and there was one special idea I added to the canvases to make them unique to each child. I bought removable adhesive letters that leave no residue for each child’s initial. I placed the letter right on the center of canvas before the kids arrived. 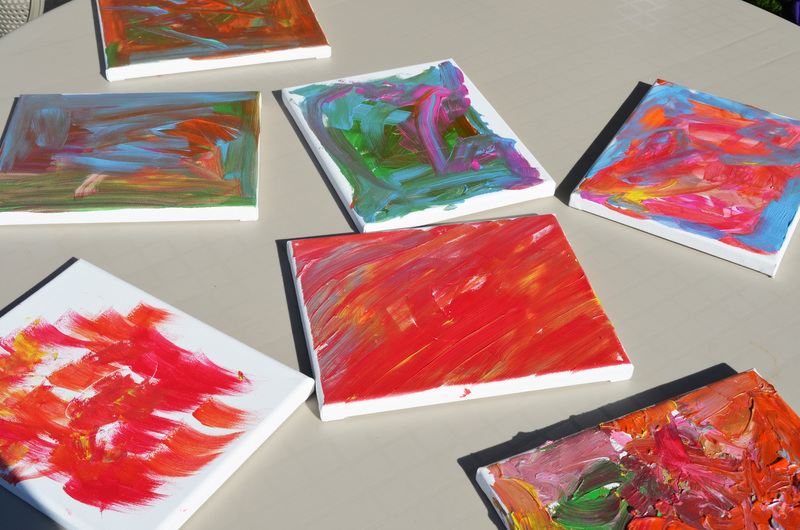 Now the kids could paint the entire canvas just having fun being messy. Link to white removable adhesive letters click here!!! Here they were drying on the table waiting for the big reveal!!! Peal the letters off and voa la!!! How beautiful are these!!! No fuss the kids had a blast and that my kind of kids craft! P.S. I also placed a big bucket in the middle of the table marked dirty brushes. That way when the kids were done the brushes were not all over the table and less likely for tiny elbows and clothing to get messy. 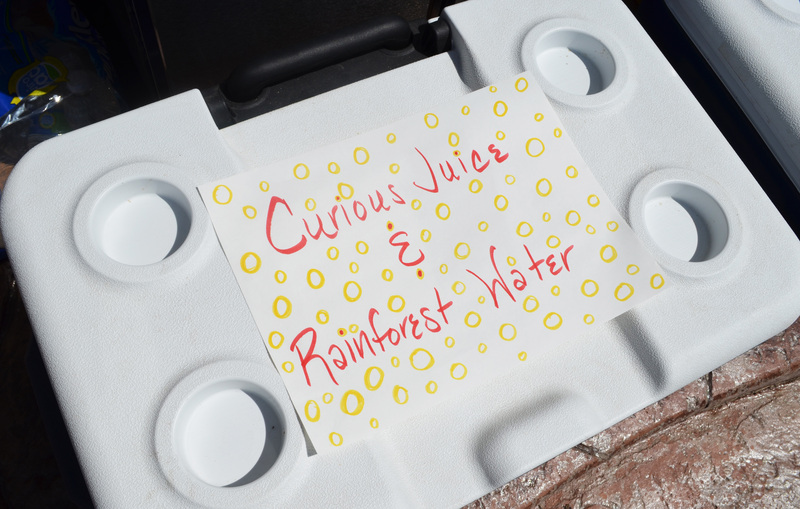 A quick little sign that makes the beverages more fun to the kiddos. Cupcakes were from Whole Foods and so delicious! I questioned if this party should of happened, if it was too much too soon for Maxwell, but at the end of the day it was the best day he had ever had! My anxiety almost got the best of me this day and thankfully I was able to pull it together for Max after the seizure incident. I’m so thankful for this day and for everyone who made it out to celebrate such a curious, lovable, sweet, shy guy that I get to call my son! I AM BLESSED! We also played the Curious George movie and music at the party. 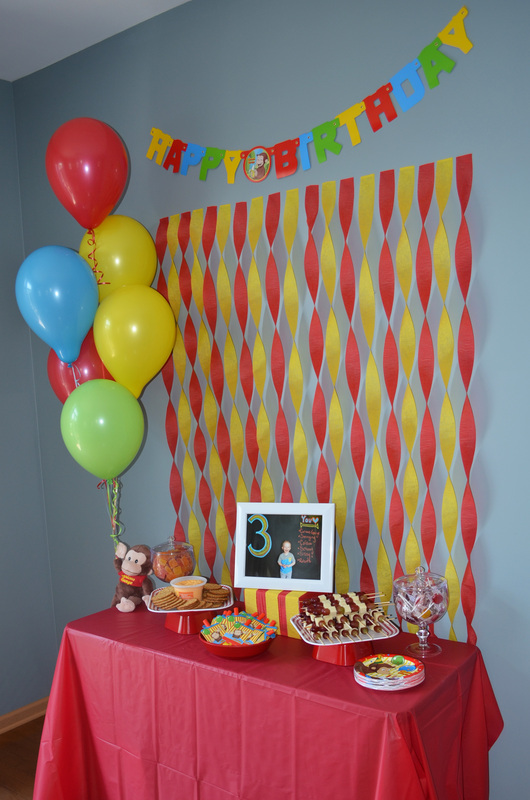 What an awesome Curious George Personalized Banner! What a fabulous party and such an adorable little boy! So glad all went well for everyone. A party he’ll never forget! You are so creative!! !